However, there are some shortages that veteran players voted while they play online. Your first attempt to create a good character will probably get you through the main game once, but if you plan on continuing on harder difficulties, odds are that your character will be severely gimped. This can be overcome through extensive research and planning, or following someone else's build. The former can be quite boring and literally take hours upon hours of studying the game, the mechanics, the skill trees, and not to mention grinding extensively for unlikely and specific gear that fits your build. The latter can lack the excitement that one would expect from so much customizability. This high skill floor and ceiling is seen as a pro for players who are deeply committed and excited by that aspect, but makes casual play less successful after normal difficulty levels. Due to it's custom-built poorly-optimized engine, the game can lag quite a lot in certain (generally small minority of) areas, as well as when there are many players in the party using system-intensive skills. Generally only experienced, high level players who play this game a lot get this issue though, and if you have even a remotely modern system (lets say anything made past 2013, assuming cheap CPU/GPU weren't used), you probably won't even be affected much or at all either. It takes an exceptionally long time to get any wealth, useful items, or access to endgame bosses in this game. You endlessly farm the same maps, hoping you'll get lucky with a few good items, but that usually won't be the case, which can be really discouraging to keep playing. This is made worse by the fact that your character progression comes to a grinding halt near the upper 80s of character levels, requiring you to buy insanely expensive Path of Exile items to feel any progression at all. 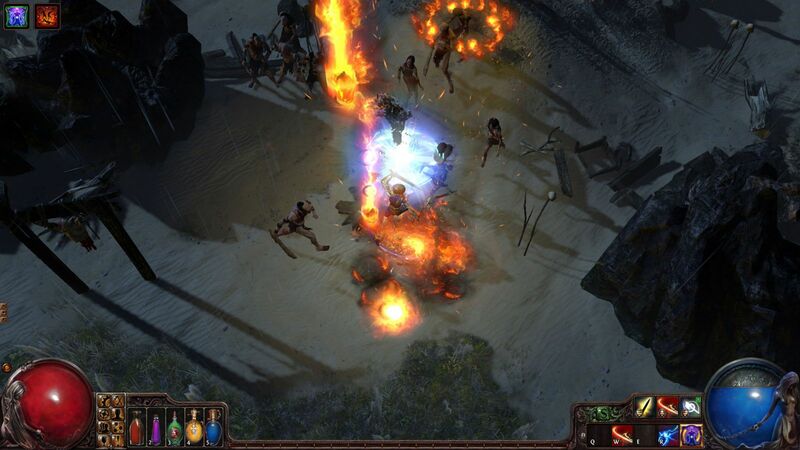 If you don't like grinding, you'll get quickly bored of Path of Exile. There's quite a lot to learn when starting to play Path of Exile. There are the mechanics, the crafting system, and the skill gem system. However, the most intimidating factor is the massive skill tree with over 1000 skill nodes, 6 classes and 19 subclasses, allowing you to create hundreds of unique builds. Unfortunately, creating a functional build is really difficult, taking hours of theorycrafting, so it might be better to stick to guides as you're starting out, unless you're fine with possibly messing up. While not terrible, the graphics don't look as polished as other AAA dungeon crawlers (such as Diablo III). The aesthetic does fit with the theme of a grimy universe full of many foul creatures, but it looks dated. Online play with melee classes may lead to some "rubberbanding," where the lag causes your character to seem to jump back to where they were a few seconds ago. This happens when latency causes the player's computer to desync from the server, and is worse the more people you have congregated in a small space.